‘Pure Deep House’ is a guide to some of the very best in deep house and garage for 2014. Packed with 60 past, present and future classics curated over three CDs by one of the best dance and urban compilation album brands on the planet: Pure. Since its launch in January 2000 with ‘Pure Garage’ – Pure have sold over two million branded compilation albums. 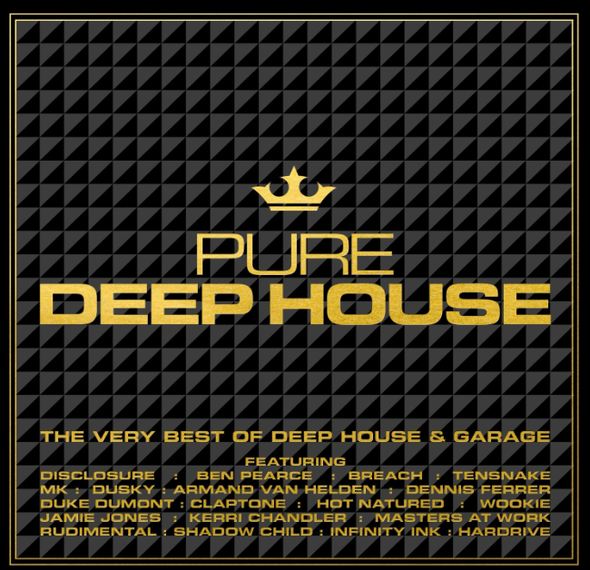 ‘Pure Deep House’ contains some of the biggest names from the scene, from Breach - who scored two top 10 UK chart hits in 2013 (that both feature here), Disclosure, Shadow Child, and man of the moment MK. It also features two exclusive new tracks Allusion – ‘Think About Me’, and Tapesh & Kant – ‘Ey Yo’. CD1 highlights include Ben Pearce’s recent No.7 chart hit ‘What I Might Do’, Breach ft Andreya Triana – ‘Everything You Never Had (We Had It All)’, Hot Natured ft. Anabel Englund – ‘Reverse Skydiving’, GotSome ft. The Get Along Gang – ‘Bassline’ and Josh Butler – ‘Got A Feeling (Pleasurekraft vs. Bontan Remix)’. CD2 features Claptone ft. Jaw – ‘No Eyes’, Infinity Ink – ‘Infinity’, Fabo ft. Lostcause – ‘Where I Stand (Karmon Remix)’, and club anthems from Green Velvet – ‘Bigger Than Prince (Hot Since 82 Mix)’, Dusky – ‘Careless’ and Jon Cutler ft. E-Man – ‘It’s Yours (NiCe7 Remix)’. CD3 is a journey of classic house and garage music that has influenced the current new wave of producers from Hardrive – ‘Deep Inside’, George Morel – ‘Let’s Groove’, Nightcrawlers – ‘Push The Feeling On (Dub of Doom)’, to more recent tracks such as Fish Go Deep & Tracey K – ‘The Cure & The Cause (Dennis Ferrer Remix)’, Lovebirds ft. Stee Downes – ‘Want You In My Soul’, and Wookie ft. Eliza Doolittle – ‘The Hype’. It’s out now on New State Music.